Activision is applying a Midas touch to GoldenEye 007 and will include a gold controller with the game's limited edition. One of the great things about FPS titles on the Wii is that there are a number of ways to play them. Gamers can choose between the standard Wii Remote/nunchuck setup, the Wii Zapper, or they can often use the Classic Controller to provide a more familiar console FPS experience. Activision, as it turns out, is going to give players the option for the latter with its upcoming remake of GoldenEye 007. 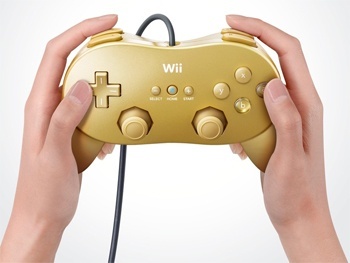 The publisher has revealed that it's going to release a limited edition hardware bundle that will come with a gold-colored Classic Controller Pro. The inclusion of the controller has been rumored for a while across the Web, but this is the first time Activision has officially said anything about it. I'm a fan of playing shooters on the Wii using a conventional means, so I think this limited edition controller is actually pretty cool. The GoldenEye 007 Classic Edition has an expected pricetag of $69.99, while the normal version of the game is listed at $49.99. With the game's November release fast-approaching, I wouldn't be too surprised to see the Classic Edition making its way into a number of Christmas stockings this year.